Anthony Cox is the Deputy Director of the Environment Directorate of the Organisation for Economic Co-operation and Development (OECD). Since joining the OECD in 2000, Mr Cox has led work on water, climate, fisheries, political economy of reform, green finance and fossil fuel subsidies. He has overall responsibility for the OECD’s Horizontal Programme on Water, which pools the expertise from across the OECD to address economic and governance issues in water policy. 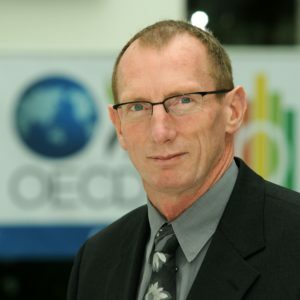 Prior to joining the OECD, Mr Cox worked as Senior Economist in the Australian Public Service, including positions in the Productivity Commission and the Australian Bureau of Agricultural and Resource Economics.